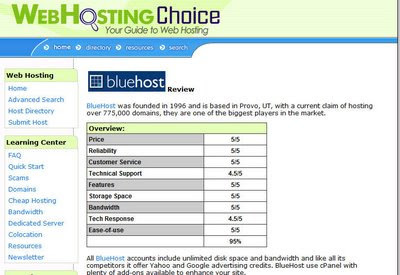 Recently I stumbled upon another good web hosting review website, it is rightly named web hosting choice as the website has lots of web hosting options. A convenient thing is they are categorized in an elegant way for you to find the host for your desired purpose. The web hosts are categorized in the left menu as ASP hosting, blog hosting, budged hosting, PHP hosting to name some. This will help you find a web host for the particular nature of your website. If I want to host my blog then the blog hosting page can show me web hosts that are good for hosting blogs. In addition to it, the full review rates each host on factors like price, reliability, features, technical support etc on a scale of 1-5. The review also mentions the features, price and other things in a well organized, easy to view tabular format. A thing I would like to comment is the review just seems to point out the good things in that host, it will be better if they provide balanced reviews of web hosts. The in depth comparison page compares the top 5 hosts on all factors, which is good page to check out. A striking feature of web hosting choice is the advanced search page. Advanced search will search for the host you are looking for. There are lots of criteria to narrow down you search from price and bandwidth to even payment options. Advanced search is a must see if you want to explore and make you investment worthy. All in all, this web host review website is well designed, easy to navigate and has very good information (like the FAQ page). If you seek to get a good web host for your website, blog or any other web application then hunt for your choices at web hosting choice and pick the correct web host for you.